The RD820 series has been discontinued. Please see the RD8250 Series as a possible alternative or contact our sales department for assistance. 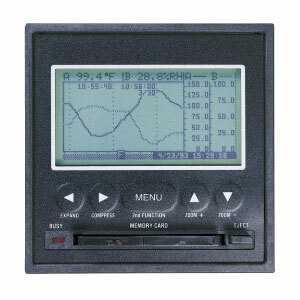 The RD820 Series paperless recorder provides single or dual channel real-time graphic display, recording, and digital display in engineering units of your measurements. The 160 x 80 pixel LCD display offers exceptional clarity with zoom, recall, scroll, rewind, and replay capability. You can compress data in time, scroll and zoom data in amplitude and search for data by alarm functions. You can view real time, average, trend, or historical data. The RD820 offers the ability to use data cards, up to 1 Mbyte in size, for storing data, as well as recorder configurations. Through an optional card reader or the RS-232 port, data may be downloaded to a PC for additional analysis, storage, or hard copy printouts. The RD820, with just five simple buttons on the membrane keypad, is easy to use. It provides versatile, reliable, low cost display and storage of data in a rugged, compact 1/4 DIN panel mount enclosure. See the Specs PDF for complete product specifications.